Subsidiarity is an organizing principle that matters ought to be handled by the smallest, lowest or least centralized competent authority. Political decisions should be taken at a local level if possible, rather than by a central authority. The Oxford English Dictionary defines subsidiarity as the idea that a central authority should have a subsidiary function, performing only those tasks which cannot be performed effectively at a more immediate or local level. The word subsidiarity is derived from the Latin word subsidiarius and has its origins in Catholic social teaching. The origins of subsidiarity as a concept of Catholic social thought lie with Wilhelm Emmanuel von Ketteler, who served as Bishop of Mainz in the mid- to late 19th Century. It most well-known, however, from its subsequent incorporation into Pope Pius XI’s encyclical Quadragesimo anno. This encyclical’s formulation of subsidiarity is the touchstone from which further interpretations tend to depart: "Just as it is gravely wrong to take from individuals what they can accomplish by their own initiative and industry and give it to the community, so also it is an injustice and at the same time a grave evil and disturbance of right order to assign to a greater and higher association what lesser and subordinate organizations can do. For every social activity ought of its very nature to furnish help to the members of the body social, and never destroy and absorb them." As with many social encyclicals in the modern period, this one occurs in the historical context of the intensifying struggle between communist and capitalist ideologies, exactly forty years – hence the title – after the Vatican’s first public stance on the issue in Rerum novarum. Promulgated in 1931, Quadragesimo anno is a response to German National Socialism and Soviet communism, on the one hand, and to Western European and American capitalist individualism on the other. It broke the surface of Catholic social teaching in this context, and it is helpful to keep this in mind. The principle of subsidiarity was developed by German theologian and aristocrat Oswald von Nell-Breuning. His work influenced the social teaching of Pope Pius XI in Quadragesimo anno and holds that government should undertake only those initiatives which exceed the capacity of individuals or private groups acting independently. Functions of government, business, and other secular activities should be as local as possible. If a complex function is carried out at a local level just as effectively as on the national level, the local level should be the one to carry out the specified function. The principle is based upon the autonomy and dignity of the human individual, and holds that all other forms of society, from the family to the state and the international order, should be in the service of the human person. Subsidiarity assumes that these human persons are by their nature social beings, and emphasizes the importance of small and intermediate-sized communities or institutions, like the family, the church, labor unions and other voluntary associations, as mediating structures which empower individual action and link the individual to society as a whole. "Positive subsidiarity", which is the ethical imperative for communal, institutional or governmental action to create the social conditions necessary to the full development of the individual, such as the right to work, decent housing, health care, etc., is another important aspect of the subsidiarity principle. The principle of subsidiarity was first formally developed in the encyclical Rerum novarum of 1891 by Pope Leo XIII, as an attempt to articulate a middle course between laissez-faire capitalism on the one hand and the various forms of communism, which subordinate the individual to the state, on the other. The principle was further developed in Pope Pius XI's encyclical Quadragesimo anno of 1931, and Economic Justice for All by the United States Conference of Catholic Bishops. Since its founding by Hilaire Belloc and Gilbert Keith Chesterton, Distributism, a third way economic philosophy based on Catholic Social teaching, upholds the importance of subsidiarity. The Church's belief in subsidiarity is found in the programs of the Catholic Campaign for Human Development, where grassroots community organizing projects are supported to promote economic justice and end the cycle of poverty. These projects directly involve the people they serve in their leadership and decision-making. ↑ Daly, Lew (2010-01-08). "God's Economy". The Financial Times. Retrieved 2010-01-25. ↑ Michael J. Shuck, “Early Modern Roman Catholic Social Thought, 1740-1890,” Modern Catholic Social Teaching: Commentaries and Interpretations, eds. Kenneth Himes, O.F.M., Lisa Sowle Cahill, Charles E. Curran, David Hollenbach, S.J., and Thomas Shannon (Washington, D.C.: Georgetown University Press, 2005), 112. 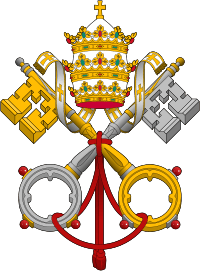 ↑ Pope Pius XI, Quadragesimo anno, May 15, 1931, http://www.vatican.va/holy_father/pius_xi/encyclicals/ documents/hf_p-xi_enc_19310515_quadragesimo-anno_en.html, §79. ↑ Gregory R. Beabout, “Challenges to Using the Principle of Subsidiarity for Environmental Policy,” William and Mary Environmental Policy Review 28 (2004): 226. ↑ J. Bryan Hehir, “Catholic Social Teaching and the Challenge of the Future,” Woodstock Report, June 1998 (cited in Robert K. Vischer, “Subsidiarity as a Principle of Governance: Beyond Devolution,” Indiana Law Review 35, no. 1 (2001): 103). ↑ Francis P. McHugh, Catholic Social Thought: Renovating the Tradition – A Keyguide to Resources (Leuven: Peeters, 2008) 91. ↑ For further elaboration, see Pope Leo XIII, Rerum novarum, May 15, 1891, http://www.vatican.va/holy_father/leo_xiii/encyclicals/ documents/hf_l-xiii_enc_15051891_rerum-novarum_en.html,, §48-51 and Quadragesimo anno, §29-39. ↑ Robert K. Vischer, “Subsidiarity as a Principle of Governance: Beyond Devolution,” Indiana Law Review 35, no. 1 (2001): 119. (Quoting Fred Crosson, “Catholic Social Teaching and American Society,” Principles of Catholic Social Teaching, ed. David A. Boileau (Milwaukee: Marquette University Press, 1998), 170-171). ↑ "Das Subsidiaritätsprinzip als wirtschaftliches Ordnungsprinzip", Wirtschaftliche Entwicklung und soziale Ordnung. Degenfeld-Festschrift, Vienna: von Lagler and J. Messner, 1952, pp. 81–92 , cited in Helmut Zenz, DE . ↑ Catholic campaign for human development, USCCB .